Let's face it: Minivans are still the gold standard for family hauling, or anybody else who needs to haul eight passengers and their stuff. With that in mind, the Honda Odyssey is the gold standard of minivans, offering roomy and comfortable accommodations, innovative features and class-leading fuel economy at virtually every price point. The many things I love about my Honda Odyssey. I love my Honda Odyssey. I do not need to pull out my keys to get into the vehicle, which is key with two children. The keyless start took a little getting used to, but I really like that I never have to take my key out of my purse. Traveling is great! I love riding as a passenger and driving this vehicle. We do not worry about packing lightly when we go to the grandparents, as there is plenty of space. We can also take extra people along, even with two car seats. There are numerous spots to put things up front, and the cooler box is really helpful for keeping a few beverages cold. There is a built in small garbage bag holder, which is handy. The turning radius is impressive for a vehicle of its size. I like being up a little higher when I drive, but I do not feel like I am driving a big vehicle. I love the camera that shows what is to my right when I use the right blinker and the backup camera. The sensor that lets you know you are coming up on something a bit too fast is also very handy. I love our minivan and am not afraid to tell my friends we own one, because I love it so much! Honda odyssey great family van! I am a mom to a baby and caregiver to my sister in law with special needs. The automatic doors are a lifesaver when I have two kids to put into the van. Being only 5’2, I love that I am able to adjust the driver seat forward, backward and upward so I am at a comfortable height to drive safely. The functions are easy to navigate and have a safety feature which limits AUX functions to only when vehicle in stopped. The chairs are comfortable, easy to remove and slide out of the way and provide plenty of space for groceries, car seats, strollers and other equipment. The gas is economical when maintaining constant speeds and great for long distance trips. Easy to drive, smooth ride and has great features like right turn and rear camera. We have the van in the gray color which hides dirt and mud but cleans nicely. With different climate controls in the different rows, everybody is comfortable on hot or cold days. Very pleased with the purchase and recommend to others with families. 2015 Honda Odyssey Touring Elite with built in shop vac! 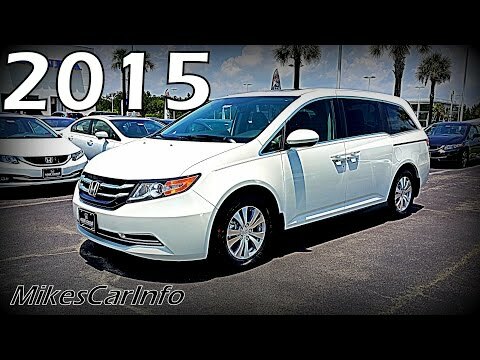 I have a 2015 Honda Odyssey Touring Elite. I have owned it for a couple of weeks now. So far we have had no performance issues or any problems. All of the seats are very spacious & comfortable. I have lower back & sciatica issues & I am able to drive comfortably in this vehicle. My favorite features are the lane departure warning, being able to spread out the 2nd row seats, the middle seat can slide closer to have easier access to a child in a car seat, the built in vacuum, the cool box & the DVD player. So far my only 2 cons are that it does not have a digital speedometer like my previous vehicle & the navigation system is not very easy to use. I'm sure it will get easier with practice but I am used to a touch screen to input addresses whereas this one has a dial to turn to select each letter/number. Honda will notify owners, and dealers will install an additional bracket and spring to both second row outboard seats, free of charge. Interim letter has been mailed, and a second notification will be sent . Owners may contact Honda customer service at 1-888-234-2138. Honda's number for this recall is KD5. Honda (American Honda Motor Co.) is recalling certain 2014-2016 Honda Odyssey vehicles. The second row outboard seats have a lever to fold the seatback and slide the seat forward to access the third row seats. Due to a manufacturing error, if the walk-in release lever is used to fold a fully reclined left outboard seatback forward, the seatback may stay in the unlocked position (free-folding) or unexpectedly unlock without engaging the walk-in or recliner lever. An unlocked second row left outboard seatback increases the risk of injury to the seat occupant during a crash. Honda will notify owners, and dealers will confirm proper operation of the second row left outboard seatback, and install a support bracket to the seat recliner. If the seatback cannot lock, dealers will replace the seatback frame assembly. These repairs will be performed free of charge. The recall began May 7, 2018. Owners may contact Honda customer service at 1-888-234-2138. Honda's number for this recall is X0R.